Welcome to the Christmas In July Blog Hop! We are showcasing the beautiful Carols of Christmas Bundle which is available August 1st as an early release from the upcoming Holiday Catalog. 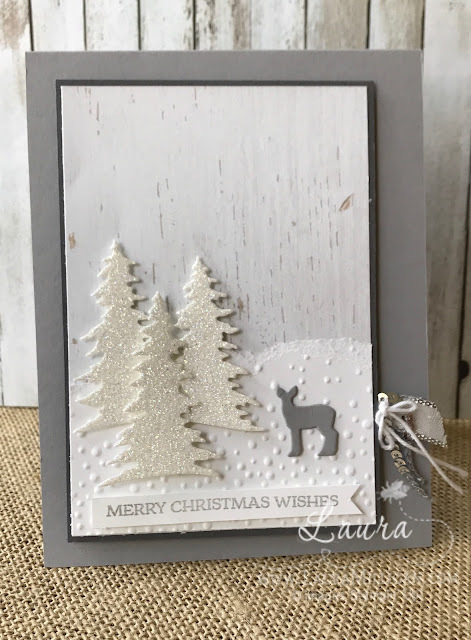 I chose to focus on the thinlets from this bundle - and created a peaceful winter scene for my card. I used dazzling diamond glimmer paper to create the sparkling winter trees. I layered these over a piece of Wood Texture Designer Series paper and a layer of Whisper White card stock that I embossed with the Softly Falling embossing folder - I tore the edge of this layer to create a slight downhill slope. This entire layer was adhered to a layer of Basic Gray cardstock and attached to a Smoky Slate card base. I added some bits of ribbon and bling with the Mini Sequin trim and 3/8" Metallic-Edge Ribbon, and tucked along the edge of my main layer. Thanks for hopping with us today - I am sure you will find a lot of very creative, inspiring projects as you visit all of the different blogs. Shop With Me! If you don't have a Stampin' Up! demonstrator, I would be honored to be yours! If you'd like to shop, please click below to "shop now" or click on the shopping cart on my sidebar and you'll be taken to my online store. Laura, this card is stunning! 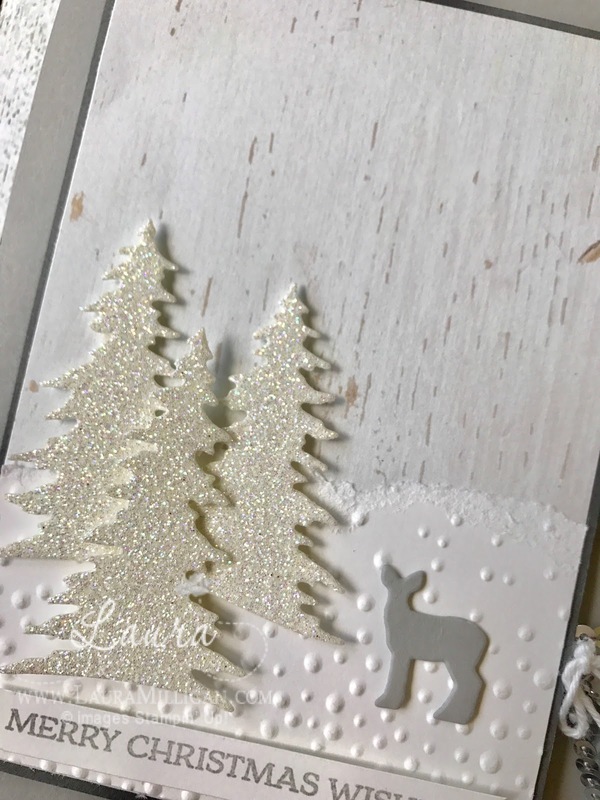 I love how you mixed the textures of different white papers and embossing. It turned out great. Thanks for hopping! So much detail and texture in your gorgeous monochromatic card.